I like this movie very much. It is one of my favorite videos. The movie was very well made. The character Jesse in my opinion is pretty accurate for a foster child. Many of the same behaviors are in "real" foster kids. I like how he comes to peace in the end from his past and how he accepts his new parents. I like how clean the movie was and it was touching! Whales are a source of constant wonderment and awe for millions of people all over the world, which is what makes "Free Willy" such an awesome flick. The movie chronicles the friendship and tribulation of a boy and a 7,000-pound orca whale, instantly winning over our hearts with its family oriented entertainment. The characters are a division of the likeable and the despised, with a story that pits man against nature and proves to be a race for survival. Jesse is a troubled preteen boy who, after caught by the police for spray-painting graffiti at a waterpark, is taken to live with Glen and Annie Greenwood, who welcome him despite his detached attitude. Forced to clean up the mess he's made, he soon finds himself fascinated by the mere presence of the park's giant orca, Willy, and the two quickly become friends. Jesse is the only one Willy will respond to, which makes the whale's greedy owner ecstatic, as well as surprising the park's owner, Randolph, and the trainer, Ray. The owner soon makes plans to put Willy in the spotlight, which draws a large and noisy crowd, giving Willy a severe case of stage fright and causing the show to fail. Since Willy brings in no revenue, the owner capitalizes on the fact that Willy is worth $1 million in insurance money, and plots to have him killed. At this point, the movie becomes a race against time as Jesse, Randolph, Ray, Glen and Annie struggle to take Willy back to his natural habitat. First and foremost, what makes this movie a big success is the animal character, Willy, which, with the exception of scenes in which Jesse comes into actual contact with him, is a real whale named Keiko. The whale performs some amazing stunts that are not new to anyone who's paid a visit to Sea World, but certainly have not lost their luster. Animals can be trained to do lots of things, and the movie proves that no matter how many times you watch some of these stunts, they still prove to be awe-inspiring even later. I found that it was not so much the stunts the mammal performed that intrigued me as much as it was the increasingly connective bond between Willy and Jesse. Perhaps it is the circumstances which bring them together that is what cements their friendship: in the beginning, Willy is taken from a family of whales out in the ocean, who pay visits to him while he is captive. Jesse is also an orphan, abandoned by his mother as a young boy. Their backgrounds give good reason for their understanding of one another, which is not merely a fable of fiction. The movie's appeal is furthered through its deeper meanings and themes, which are simple enough for children to understand. Jesse and Willy's friendship tells a powerful message about the bonds and the circumstances that shape them, and the resolve of the characters to save him in the end proves that human strength overcomes any situation, perilous or no. This simplicity will appeal to the younger and older sets without compromising its standards as a family film. The cast interacts well with one another, and heading up the ensemble is Jason James Richter as Jesse, who plays the troubled teen syndrome to perfection. His change from mischievous to good-natured is convincing because of his friendship with the whale as well as the acting. August Schellenberg plays Randolph, the park owner with an Indian background. Glen is played by Michael Madsen, who plays him as stern and unrelenting in trying times. This provides a bit of angst between he and Jesse, which is interesting to watch. Ray is played by Lori Petty, and Annie is played by Jayne Atkinson, who is gentle and kind in the role. Good ol' fashioned famiy films! The plot's as basic as my reviews! A former-ganger wants to free a whale from a SeaWorld. At the end, they try to kill him by draining th water, but the boy stops them with a couplea SeaWorld employees. I liked this film, but. . . I enjoyed this film enough to want to buy a copy of the video and the soundtrack. I'm an orca fan who lives in Kansas, a place where marine life is all but completely nonexistent, so I enjoyed all the footage of the wild orcas swimming free in the ocean and Jessie's friendship with Willy. Storywise, this was a great movie. The only problem I have with it is the ending, which I'm afraid gives some people the wrong ideas about setting captive orcas free. Releasing Willy to the ocean was a fine idea in and of itself, but I feel that it could have been portrayed much better. The end of this movie, while heartwarming, was very unrealistic. Willy has apparently been in captivity long enough to be accustomed to being hand-fed and perform tricks on command, yet upon his release, his instantly bonds with other wild orcas and the next two movies show him living as if he'd never been in captivity. This is far from the truth for most captive-raised whales and dolphins. Rehabilitation is a lengthy and expensive process with no guarantee that an animal will survive in the wild. Keiko, the real Willy, has been in Iceland for five years now and still is dependant on humans for food and companionship. I love Free Willy. It wwas definetly my favorite movie of all times!! I wish i could be in that movie myself. I think who ever thought of it was a brillient idea!!! Why Couldn't I be in the Movie!!!! 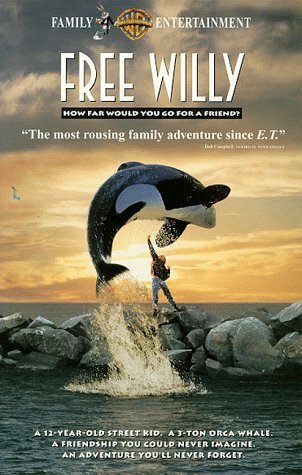 `Free Willy' will stand the tests of time as probably my all time favorite children's movie. Telling the story of friendship and freedom, `Free Willy' opens with a young Orca whale (Keiko) being singled out and captured by a group of `bad' men. The next scene shows our young star Jesse (Jason James Richter) also being captured, this time by police officers. These two unlikely friends are both placed in `captivity', Willy at the local theme park and Jesse in a foster home where he's instructed to clean up the graffiti he and a friend sprayed on Willy's observation tank. Newcomer Jason James Richter does an okay job as the hellion Jesse, a young boy whose mother abandoned him, but he overworks his bad boy image a little too much at times and comes off forced...but I feel that's a bit harsh to say since the kids so young...but then again so wasn't Haley Joel Osment and he killed in `The Sixth Sense'. Regardless of the somewhat bad acting at times, the film is redeemed every time Keiko is on the screen. Willy is truly the star of the show. ...It's that good. Now, you see, under normal circumstances I am, by and large, an action-film man, and, even if we disregard my career aspirations as a marine biologist, can someone possibly put forward a negative comment regarding this film? Because I can't. The premise is as follows, so if you don't want to know the story, skip this paragraph: Jason James Richter plays the role of Jesse, a down and out street kid, dumped by his mom six years earlier. Convinced of her return he socially attacks his new foster parents (excellent casting on both accounts by Simon Wincer)in a difficult situation which you find difficult to either sympathise or disregard with. However, following a spate of vandalism at a theme park and aquarium, Jesse is ordered to do community service, cleaning the place up. What a drag eh? That is, until he discovers Willy and befriends him, teaching him all sorts of new games and developing a friendship which, up to now in his life, has been completely absent. Oh, by the way, in case you hadn't guessed, Willy happens to be an 8 tonne Killer Whale held captive and seperated from his family by the park. After understanding Willy and his desire to reach his family again, Jesse embarks on a suspense-laden climax to the film in an effort to "Free Willy" from the park and the scheming owner, out to, literally, make a killing on Willy. I have to say, of all the movies I have ever seen (the number probably stands around 1200), this one has the best screenplay and story of the lot (rivalled, perhaps, only by The Sting, starring Robert Redford and Paul Newman). The character interaction (and in this case this is no easy feat) is faultless. Willy and Jesse emerge as the two characters who seem to actually understand the world and how it works, and in time Jesse learns to trust his trying foster parents, much to the delight of the audience. Quite simply, you're a fool if you don't see this. If any additional evidence were needed for this film's awesome cinematic contribution, it lies in the performances of Randolph, Lori Petty, and Starship Trooper's Mr. Radcheck, who plays the nasty, money-grabbing park owner. All are some of the most intriguing and distinguishable characters around in the pantheons of film archives. Finally, then, the last comment would have to be of all the movies ever made, I think it is possible to select about 20 or 30 super-significant films which turned/changed/altered the way the world looks at and appreciate films. You all know what I'm talking about. Examples would include Star Wars, which set the standard for sci-fi fantasy movies, and is still one of the best around; Jaws, which practically defined the thriller genre; Toy Story, which revolutionised computer generated films (with some help from the muche older, but often overlooked, Tron); and Goldfinger, which is classic Bond at its best. Without question, this is one such movie, defining the family/adventure genre. This is one of the best family movies of the 90's, and when the sequels failed, the original is really worth watching, with it's beautyful settings, the touching music, the good acting, and a lovely story about friendship and freedom. Of the three "Free Willy" movies, I like this one the best. A teen (Jason James Richter) befriends a whale (Keiko) and ends up getting a job working with Keiko. However, trouble arises when some criminals bust Keiko's tank trying to get rid of the whale. Jason and his friends must find a way to save Keiko by freeing him into the ocean. "SAL-IN-NA, A-UN, I-ISIS" ~ "Things Can Happen"
'Free Willy' is simply one of the best family films you'll ever see, one that is equally as captivating for adults as it is for children. The story centers around a troubled teenager named Jesse (Jason James Richter) who has just moved into yet another foster care home in the Seattle area of the Pacific Northwest. When mischevious Jesse is accused of helping to deface the local aquatic center he is forced to clean up the mess his friends left behind. He soon forms an unexpected bond of friendship with Willy, a young Orca whale in the parks water show and is offered the opportunity to help train and care for the baby Orca. For the first time in his life things are going well for Jesse. That is until the greedy owner of the aquatic center tries to kill the whale in order to collect the insurance policy money provided for in the event of Willy's death. Can Jesse convince the other trainers and his foster parents that Willy is in danger and needs their help? As Randolph (August Schellenberg), the wise Indian handyman and newfound spiritual mentor of Jesse says, "Sometimes Things Happen." Sensational film with loads of excitement that will keep you on the edge of your seat until the climatic ending. The reason this film is so moving is because it is about freedom. We all value freedom and the human spirit longs to be free. Animals are born to run free, on the earth or in the sea. The thought of trapping a whale in a tank just large enough for dolphins seems rather cruel. So, we cheer on, as a 12-year-old spunky street kid makes freeing this beautiful Orca whale possible. Jesse is the star of this movie and is at first a troubled kid who keeps thinking his mother will come back to take him home. Willy is the whale who was also taken from his family, so the two find common ground. When Willy saves Jesse's life, they form a bond of friendship and Jesse is the only one who can train the whale. The owner of the Pacific Northwest Aquatic Park plots to get insurance money by destroying the tank and when Jesse hears of the plans he has to race against time to save his friend. The scenes of the Pacific Northwest are spectacular and the whales playfully dancing in the water is a pure display of joy. These are truly on of God's most magnificent creations. Keiko, a 7,000-pound Orca is the whale star, but they also have back-up from a full-sized "animatronic" whale. I could not tell the difference between the whales, it was that good. One of the best parts of the film is when Jesse spends his pocket money to buy the whale his favorite treat, salmon. I just thought that showed Jesse's true character. While he acts tough on the outside, he seems to be fascinated with nature and animals and that brings out his more loving side. Throughout the movie, the theme of family is very important and I think that might be why this film is such a favorite. There is a music video at the beginning of this video and there is also information for children about helping save whales from becoming extinct. Overall, I felt this was a great movie for children and adults and it teaches such great lessons: that we all need a family and that we should respect animals. I was captivated from beginning to end. A wonderful movie for all ages. FREE WILLY -- the greatest friendship film of all time. Anyone who didn't like this film probably doesn't know the film's true meaning and message. This film is about freedom and forever-lasting friendship between two very unique characters who hardly have anything in common. FREE WILLY gives the message that everyone should be free -- something that every human, animal, and plant on this earth feel even if we cannot express it openly. It also gives the message that even if you don't think you have something in common with someone, you can still be friends with that person -- or animal for that matter -- even if you are very different. FREE WILLY captures the heart and soul of a young 12-year-old orphan boy and his beloved 7,000 pound Orca [Killer] Whale, Willy, who is also an orphan. The story is solid and amazing. The setting of the Pacific Northwest is brilliant. The acting is surpurb by the entire essemble cast, especially Jason James Ritcher, who gives an outstanding performance as Jesse, the young boy who befriends Willy. FREE WILLY is basically about Jesse, who at the beginning of the movie, is a struggling, troubled kid who lives on the streets. His mother left him years ago, and he's always hoping his mother would come back for him. He hangs out with a regular street-gang of kids, who steal to get food and money. When the gang splits up as being chased by the cops, Jesse and his best friend hide out in Willy's labratory tank. They find some paint cans in the workshop and decide to "decorate" the place by spray painting the entire labratory. The cops find the two boys in the labratory. Jesse's friend escapes, but Jesse is caught and arrested. Jesse is punished by one of the cops: He must live with a couple who wants to adopt him and clean up the mess he and his friend made in the labratory. Jesse reluclenty agrees to this plan, and goes to live with the friendly couple and cleans up the mess. Jesse eventually meets Willy and they instantly become attached to each other, especially after Willy saves Jesse's life when he falls into his tank by accident. The owner of the labratory claims that Willy isn't trying to be friendly -- Willy is probably the most unfriendly animal they have at the labratory. But when the man who sponsers the labratory wants to destroy Willy's tank in hopes that they will get a high insurance rate, Jesse must find a way to save his friend and put him back into the ocean with his family. I would give it ZERO stars, if I could! What's with you? !